The 4 Mile Creek area near Boulder, Colorado, was devastated by an extreme rain/flood event in September 2013. An op-ed in today’s New York Times, How We Know It Was Climate Change, is well worth reading. The author of the op-ed, N.S. Diffenbaugh, lays out the rationale for a link between climate change and extreme weather events. Diffenbaugh’s op-ed is based on a journal article written by himself and others that was published in the Proceedings of the National Academy of Sciences (PNAS – 3/17), Quantifying the influence of global warming on unprecedented extreme climate events. Both the op-ed and the PNAS article are essential reads for the new year. A few days ago I did the hike to Grinnell Glacier, one of the iconic glaciers in Glacier National Park. The glacier lies within the Swiftcurrent drainage area, in the northeastern part of the park. The hike, at least the way I did it, is about 11.6 miles round trip. It is possible to catch a boat ride at the Lake Josephine Boat Dock by the Many Glacier Hotel, which cuts the hike down to about 7.5 miles round trip. But – the first boat goes out at about 8.30 am, and as I didn’t want to wait around for it, I decided that adding on the extra miles for a fairly level stretch around Swiftcurrent Lake and Josephine Lake would be easy to do. It is an easy hike around the lakes and a very good warm-up for the rest of the climb to Grinnell Glacier. But – be aware that this area is known for grizzly bear activity as I found out when I met up with a grizzly on the trail. Because I’m writing about this encounter, it obviously ended OK, although I was glad I had bear spray readily available. The glacier is named after George Bird Grinnell, who first explored this area during the summer of 1885. Because of bad weather, he did not actually get to the glacier during his 1885 travels. However, during the late fall of 1887, he was able to pack most of the way into the glacier by mules, and then hike the remaining distance by foot. Although he certainly was not the first person to see the glacier, the glacier does bear his name, presumably given it by a Lieutenant John H. Beacom of the United States Army, 3rd Infantry, who accompanied him on the 1887 trip to the glacier. It’s fun to see ripple marks in the Proterozoic rocks that outcrop along the Grinnell Glacier trail (Grinnell Lake is in the photo’s background). Back to the hike – after about a mile from the junction of the Swiftcurrent Lake Trail with the trail coming from the North Shore of Lake Josephine boat dock, Grinnell Lake comes into view. A little further along the trail one can see Grinnell Falls dropping several hundred feet down from the headwall behind Grinnell Lake. Grinnell Falls drops several hundred feet down from the headwall to Grinnell Lake. The Salamander Glacier can be seen in the photo’s upper right-hand corner; Gem Glacier is in the upper left-hand corner of the photo. And – even at this distance, Salamander and Gem glaciers pop into view in the distant cirque. The hike continues along beautiful alpine meadows and even through one waterfall that cascades down the cliff adjacent to the trail. There is a rest area with pit toilets right before hiking the final switchbacks that traverse the terminal moraine to the Grinnell Glacier Overlook. The final part of the Grinnell Glacier trail traverses the glacier’s terminal moraine. Large boulder (Elrod’s Rock) in the Grinnell Glacier’s terminal moraine. Note the marmot atop the boulder for scale. The glacier’s terminus is now about a mile away from this boulder. 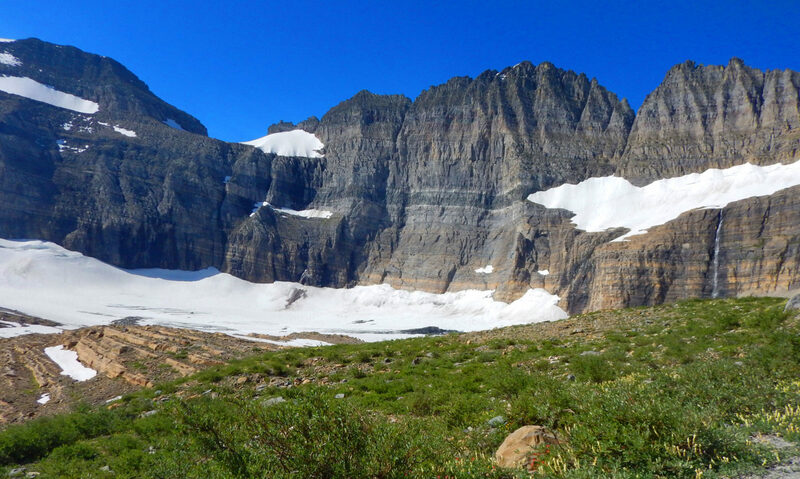 The three glaciers that once comprised the Grinnell Glacier occupy parts of a cirque developed along the area called the Garden Wall. The cirque of the Grinnell, Salamander, and Gem glaciers. Grinnell Glacier is still the largest of the three ice fields and covers about 152 acres. Unfortunately, this glacier is receding rapidly as the U.S.Geological Survey notes that from 1966 to 2005 it lost about 40% of its acreage. At about 5 acres, the hanging glacier called Gem Glacier, is the smallest named glacier in the park. It sits in the notch on the cliff face above the Grinnell Glacier. This glacier lost about 30 percent of its acreage from 1966 to 2005. The Salamander Glacier covers about 57 acres on a ledge off to the east side of the Grinnell Glacier. It apparently separated from the Grinnell Glacier sometime before 1929 and has undergone a 23% size reduction from 1966 to 2005. For those interested in viewing photographs of the Grinnell Glacier from various times and viewpoints, the U.S. Geological Survey’s Repeat Photography Project has many archived photographs. This project is a documentation of glacial decline through photography and it is well worth perusing through their photo archives. Two of the earlier photographs are shown below – one from the original 1887 trek and a later view of the glacier from 1940 just to pique one’s interest. 1887 photograph of the Grinnell Glacier taken from footbridge (Lieutenant Beacom, Glacier NP. Public domain). Grinnell Glacier from trail 1900; Credit: F.E. Matthes, Glacier NP. Public domain. The Canadian Rockies to Alberta Badlands geology guidebook is published by the Association for Women Geoscientists. “TECTONICS, CLIMATE CHANGE AND EVOLUTION – SOUTHERN CANADIAN CORDILLERA: Road Log and Accompanying Narratives From: Calgary – Lake Louise – Icefields – Field – Revelstoke – Fernie -Dinosaur Provincial Park – Calgary”, published by the Association for Women Geoscientists, 2016. This field trip guidebook is written by Katherine J.E. Boggs and Debra L. Hanneman, and edited by Janet Wert Crampton and Stephanie Yager. It is the AWG’s first fully published field trip guidebook and is a field-tested guide from their two-week 2014 field trip through the Canadian Rockies and Alberta’s Badlands area. The guidebook is a 209-page geology tour through many of the well-known parts of the Alberta Canadian Rockies, including the Front and Main Ranges of the Canadian Rockies and the Columbia Icefields. The Burgess Shale’s Walcott Quarry, the Okanagan Valley vineyards, and the Rocky Mountain Trench are trip highlights for geo-tours in British Columbia. The field trip guidebook ends with a geology tour of the Crowsnest Pass area on the British Columbia/Alberta border, and with field stops in Alberta’s Dinosaur Provincial Park and at the Royal Tyrrell Museum, Drumheller, Alberta. The field guide is printed on double-sided 8.5″ x 11″ pages with the guide cover on 100 lb paper and the text on 80 lb paper. It has black wire-o binding and a clear acetate front and a black acetate backing for improved field durability. The guidebook’s cost is $55 USD (which includes shipping), and can be purchased at the AWG online store or by phoning the AWG main office at 303-412-6219. A very large crack is forming in the Larsen C Ice Shelf on the Antarctic Peninsula. The crack is up to 1,500 feet wide and will most likely generate one of the largest icebergs on record. Only 6.4 miles of ice are keeping the ice sheet from calving off an iceberg that is basically the size of Delaware. Researchers who have been studying the ice melt (Project MIDAS) estimate that although the exact timing of the calving event in unclear, it could occur easily within the next few months. In fact, scientists noted that the crack spread another approximately six miles during the second half of December 2016. From January 1st to January 19th, the crack expanded again, and now only 6.4 miles of unbroken ice remains. Once the calving event occurs, scientists are concerned that it will destabilize the Larsen C ice sheet to the point of its disintegration. The current location of the rift on Larsen C, as of January 19, 2017. Labels highlight significant jumps. Tip positions are derived from Landsat (USGS) and Sentinel-1 InSAR (ESA) data. Background image blends BEDMAP2 Elevation (BAS) with MODIS MOA2009 Image mosaic (NSIDC). Other data from SCAR ADD and OSM (update on graphic from Freedman, based on Project MIDAS data). Iceberg Lake is situated in the Many Glacier area of Glacier National Park. The hike is about a 10 mile round trip and gains about 1275 feet in elevation. The trail winds through prime grizzly bear habitat, so be sure to hike with a group, make lots of noise, and carry bear spray. When I hiked the trail back in September, many returning hikers told our group about a grizzly sow and two cubs that were roaming around by Iceberg Lake. The bears actually walked by the lake shore while my group and many others were at the lake, but there were no harmful encounters. However – just this past week, in this same general area, a sow grizzly with 2 sub-adult cubs (I’m guessing that this is the same set of bears that walked by my group at Iceberg Lake) was surprised by a lone hiker and the sow grabbed and shook the hiker. The hiker used his bear spray escaped with puncture wounds to his lower leg and a hand. So – some words of caution about about hiking in bear country! A part of the Iceberg Lake Trail – note the u-shape valley sculpted by glacial processes. The trailhead to Iceberg Lake is behind the cabins near the Swiftcurrent Motor Inn. The first part of the hike, about 1/4 mile, gains about 185 feet. After that initial elevation gain, the trail’s elevation gain moderates. Ptarmigan Falls is about 2.5 miles from the trailhead, and a short way above this is a footbridge that crosses Ptarmigan Creek. The rocky area near the footbridge is a great place for a snack break. Another 1/10 mile beyond the footbridge is the Iceberg Lake Trail junction. The Ptarmigan Trail continues towards the right and goes to Ptarmigan Tunnel and Ptarmigan Lake.Take the other trail branch to continue on to Iceberg Lake. A good trail hike summary for the Iceberg Lake Trail is found at the website “Hiking in Glacier”. Footbridge over Ptarmigan Creek – good place for a snack break. Nearing Iceberg Lake as the snow and sleet continue to fall. The popularity of the trail was clear to me when even on a rainy, sleety, and snowy day,I passed many people on the trail. My group did a leisurely hike, stopping at several places to look at the geology alongside the trail and to do a snack stop by the Ptarmigan Creek footbridge both on the way up and back. It took us about 5 hours for the round trip. That put us back just in time to have a much enjoyed dinner at the Swiftcurrent Motor Inn. Ah – the trail’s end at Iceberg Lake! Comparisons of the Iceberg Glacier from 1940 to 2015. The photo on the left is a circa 1940 Hileman photo (GNP Archives) the center photo is a 8/14/2008 photo by Lisa McKeon, USGS, and the photo on the right is a 9/6/2015 photo by Debra Hanneman. Click on the photo to enlarge it in a new window. This project began in 1997 with a search of photo archives. We used many of the high quality historic photographs to select and frame repeated photographs of seventeen different glaciers. Thirteen of those glaciers have shown marked recession and some of the more intensely studied glaciers have proved to be just 1/3 of their estimated maximum size that occurred at the end of the Little Ice Age (circa 1850). In fact, only 26 named glaciers presently exist of the 150 glaciers present in 1850. Jeff Kuhn points out sheet sands interbedded with muds in Proterozoic Grinnell Formation. The rocks exposed firstly from the top down are old sedimentary rocks of the Belt Supergroup. It is called “Belt” after Belt, Montana, and “supergroup” because it is immense. These rocks were deposited in a Mesoproteozoic (1.6-1.2 Ga) sea basin, and show little to no metamorphism despite their age. Rip-up clasts in Proterozoic Grinnell Formation. I was lucky to be hiking with Jeff Kuhn from Helena, Montana, who has done much work with Belt Supergroup rocks in the Glacier Park to Whitefish Range areas. Jeff stopped us at several locations along the trail to look more closely at features within the Grinnell Formation. In general, the Grinnell Formation consists of sandstone and argillite and is approximately 1740-2590 feet thick. It has a deep brick-red color owing to its contained hematite and because it was deposited in a shallow oxygen-rich environment. Sedimentary features that are consistent with the shallow water depositional interpretation include mudstone rip-up clasts, mudcracks, and ripple marks. Mudcracks preserved in the Proterozoic Grinnell Formation. All told, it was a hike well worth doing, even if you are not a geology enthusiast! Ripples preserved in the Proterozoic Grinnell Formation. The Athabasca Glacier, a part of the Columbia Icefields in the Rocky Mountains of Alberta, Canada, has receded 0.93 miles (1.5 km) over the last 125 years. Climate Change 2014 – Mitigation of Climate Change. By 2035, natural gas demand will outpace that of any other individual fuel and end up nearly 50% higher than in 2011. Demand for gas will come mostly from the Middle East—driven by new power generation—but also from Asian countries, including China, India, and Indonesia, and Latin America. Power generation continues to be the largest source of gas demand, accounting for around 40% of global demand over the period. New gas plants, meanwhile, are expected to make up around a quarter (or 1,000 GW) of net capacity additions in the world’s power sector through 2035. First the aforementioned wisdom: Natural gas is unquestionably helping the United States reduce its climate footprint. Our nation’s greenhouse-gas emissions have dropped to levels not seen since the 1990s, thanks in part to this cleaner-burning fuel. Natural gas produces half the carbon emissions of coal and about a third fewer than oil. This is why everyone in the Obama administration, including the president himself, can’t talk enough about the climate benefits of natural gas. Three disparate factors make the relationship between natural gas and climate change not so unequivocally simple and good. Concerns about methane emissions persist, but notwithstanding that challenge, two greater problems loom: First, shifting significantly away from coal to natural gas doesn’t get the planet anywhere close to the carbon-reduction levels scientists say we must reach. And second, while the natural-gas boom is great for the economy and the immediate reduction of greenhouse-gas emissions, it has deflated the political urgency to cut fossil-fuel dependence, which was more compelling when we thought our resources of oil and natural gas were scarce. We have a great problem of energy abundance. Obviously, natural gas is not the total panacea for “fueling” the transition to a carbon-negative energy mix. But given the current and predicted production/market conditions, it will be a considerable part of the future global energy equation. As a policy measure to reduce GHG emissions, increasing population density appears to have severe limitations and unexpected trade-offs. In suburbs, we find more population- dense suburbs actually have noticeably higher HCF, largely because of income effects. Population density does correlate with lower HCF when controlling for income and household size; however, in practice population density measures may have little control over income of residents. Increasing rents would also likely further contribute to pressures to suburbanize the suburbs, leading to a possible net increase in emissions. As a policy measure for urban cores, any such strategy should consider the larger impact on surrounding areas, not just the residents of population dense communities themselves. The relationship is also log−linear, with a 10-fold increase in population density yielding only a 25% decrease in HCF. Generally, we find no evidence for net GHG benefits of population density in urban cores or suburbs when considering effects on entire metropolitan areas.